Lactoferrin extracted from bovine colostrum (“mothers’ first milk”). 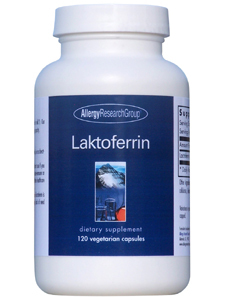 Our lactoferrin has 95% purity and 77.5% to 80.5% iron-binding capacity. Suggested Use: As a dietary supplement, 1 to 3 capsules per night before bed, or as directed by a healthcare practitioner.